Stitch a Delicious Stitcher's Box With Stitching Accessories! 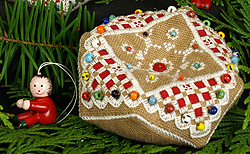 This set of Christmas Smalls is stitched on a Gingerbread coloured linen, using delectable silk flosses, sparkling beads and delicious looking ‘candy’ buttons. 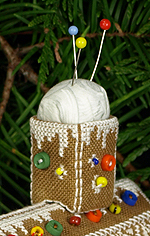 A lined Gingerbread House trimmed with button and bead candies, and decorated with white stitched ‘icing sugar’ is a delicious addition to my Gingerbread Garden Sampler! Sweet icing-sugar snow covers everything. 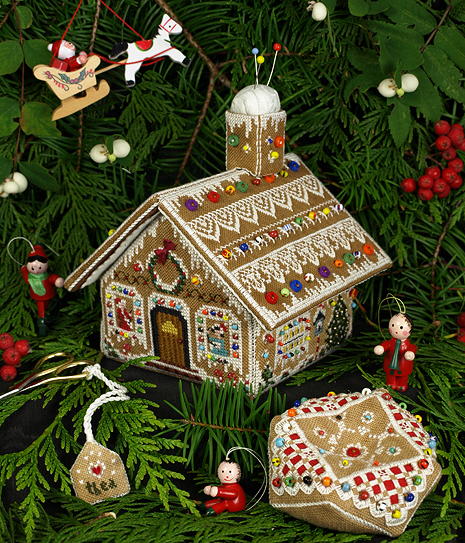 A Gingerbread boy and girl stand next to one window, amid the candy canes and delectable candy flower beds. A jaunty snowman made of icing sugar is watching over one of the Gingerbread birdhouses, where tiny cardinals are feeding. The whole delicious fragrant Gingerbread house is dripping with icing, has glowing windows, and lots of decorative candies to welcome the hungry visitor. 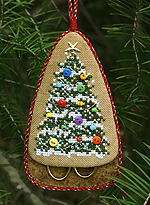 The matching Biscornu, Chimney Pincushion and Scissors Fob are the perfect Christmas Stitching Accessories! 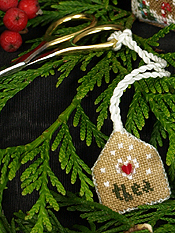 As a bonus, a matching ‘Gingerbread Tree’ Scissors Keep pattern is published in the JCS 2009 Christmas Ornament issue! 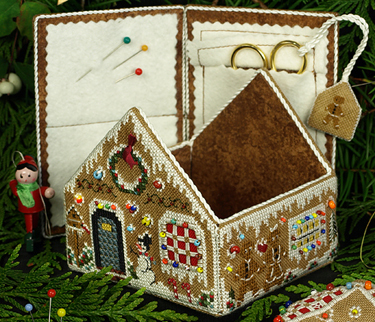 This and all Stitching Accessories will fit snugly inside your Gingerbread Christmas Stitching House. 110WFP - White Floss Accessory Pack contains plenty of white silk floss to stitch all items in the leaflet.